14 Beautifully Appointed Guest Rooms. 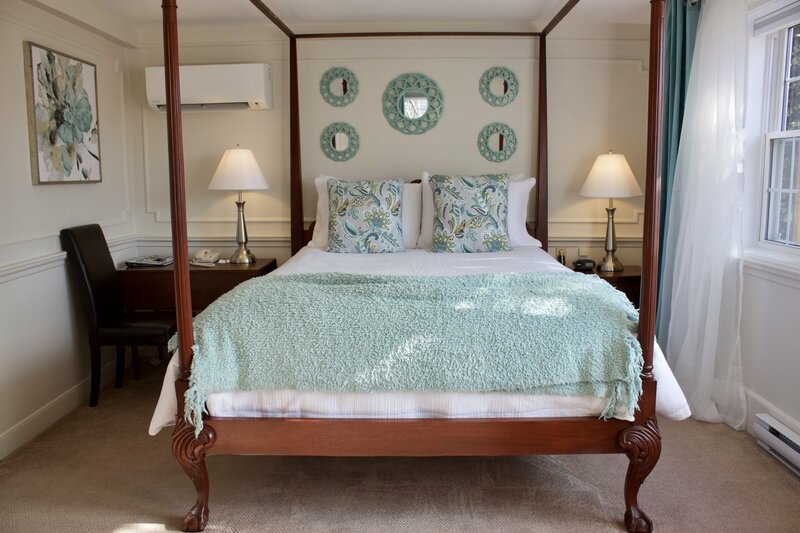 All our guest rooms are tastefully decorated with a blend of period antiques with modern touches offering private ensuite bathrooms, flat screen TV’s, complimentary WiFi and full gourmet breakfast. 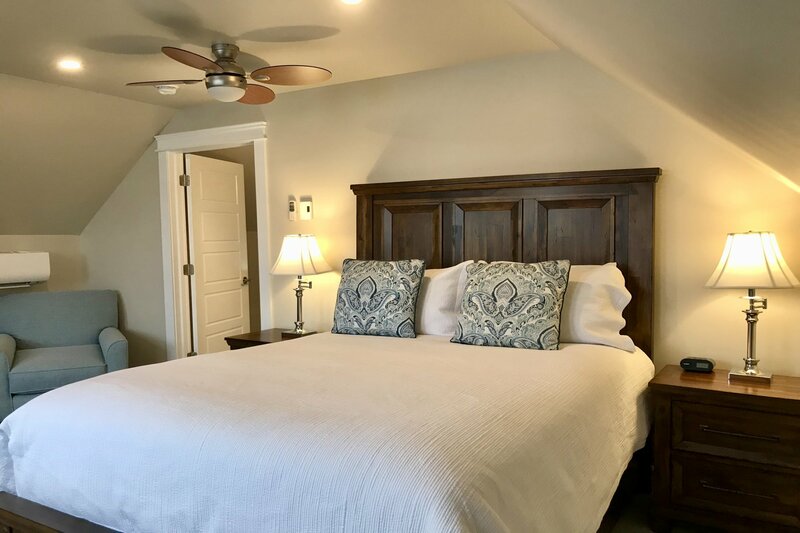 The Main House features spacious rooms on the second floor with King and Queen size beds while The Carriage House offers rooms on both the ground and second floor with queen or double beds and two private second floor suites with king and queen size beds and outdoor sitting areas. 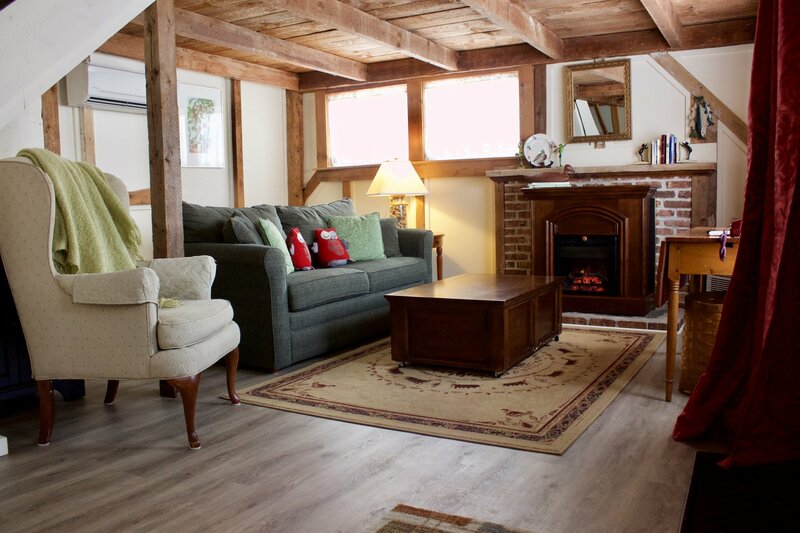 Our unique cozy 2 storey cottage offering a queen size bed and ensuite on the second floor with sitting area and fireplace on the main floor. Welcome to our newest suite. 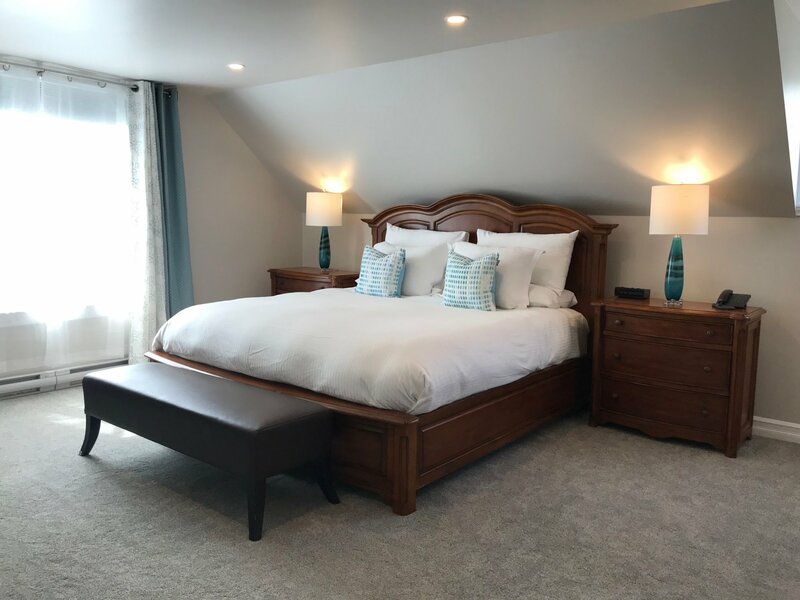 This 500 square foot luxury 2nd floor suite is another ultimate Tattingstone experience featuring a luxurious King bedroom, an in-room sitting area and a cherry wood French Provincial writing desk. Relax in bed while watching the 60 inch 4K flatscreen Television. A separate sitting room with flatscreen TV and sofa/daybed adjoins the master suite. Enjoy the 3 x 5 foot glass walk in shower with waterfall or a rejuvenating bath in the oversize claw foot tub. 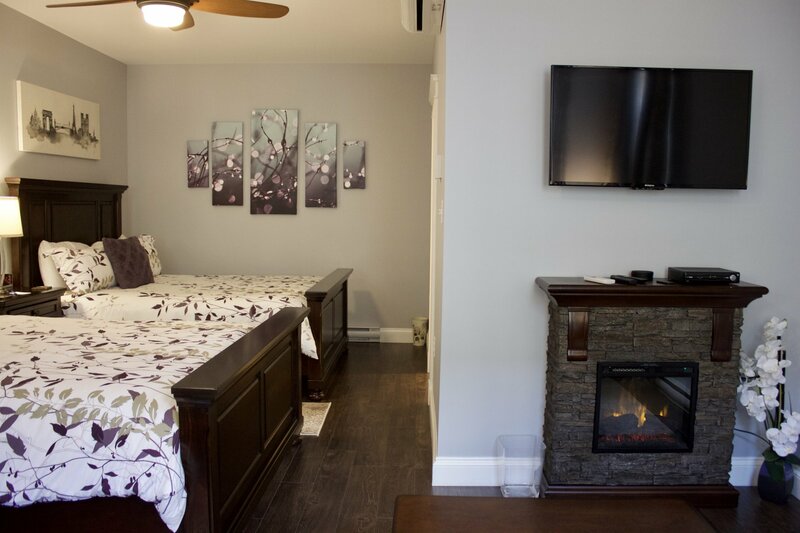 Fibre OP High Speed internet/cable and decorative fireplace complete this amazing suite. A spacious and elegant room featuring a carved king bed with marble accents facing an electric fireplace and 55 inch flatscreen TV. A genuine leather queen pull out sofa with soft chairs complete the sitting area. 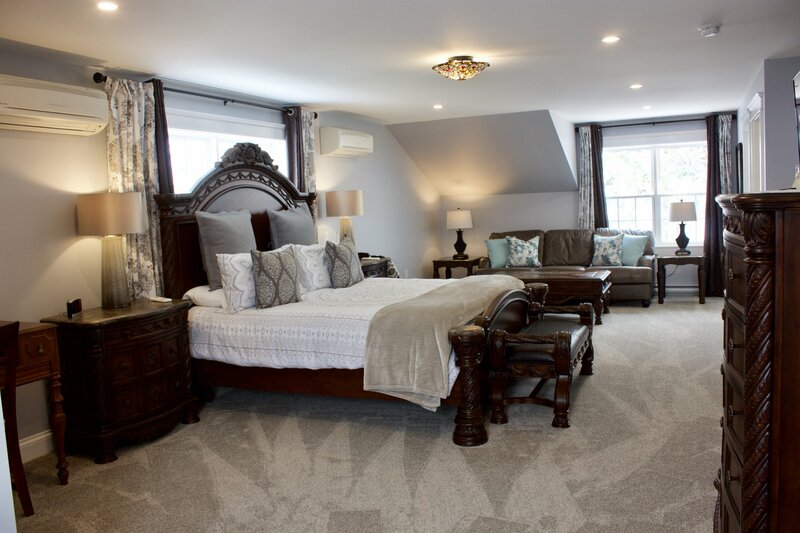 Located on the second floor in the Carriage House, with views of the Minas Basin on your own private roof top deck. It comes equipped with an antique desk for those who want to write a letter home or are here on business. 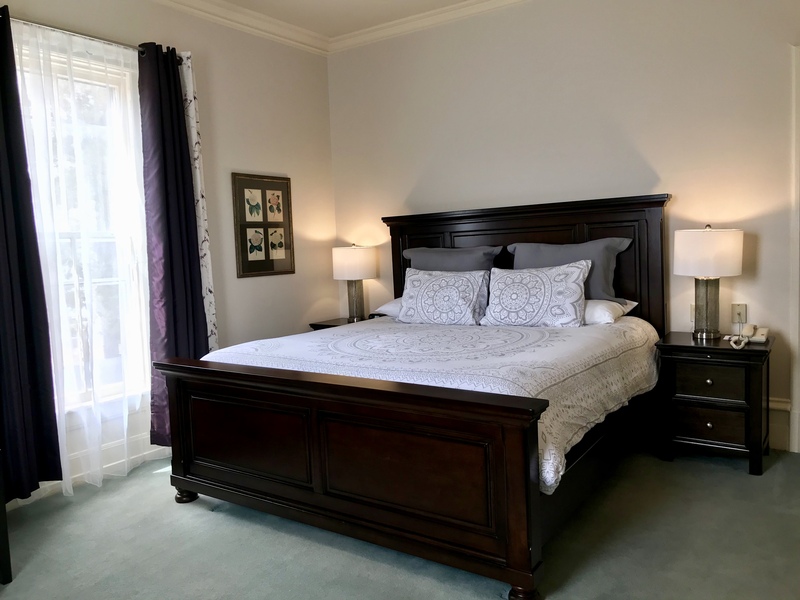 A large, sunny corner room located on the second floor in the main house featuring a new cherry hardwood king bed with turned leg detail and matching nightstands decorated in rich plums and soothing warm grey tones. It has a large writing table for those traveling on business and sitting area with two comfortable chairs . The mirrored bath has a small tub and tiled stall shower. A beautiful and relaxing room. Two person capacity. This elegant room decorating in warm grey and blue tones features a cherry hardwood king bed with matching nightstands facing the electric fireplace. Located on the second floor in the main house, this room overlooks the garden with two comfortable wingback chairs for relaxing with a good book or watching TV. The largest and some would say the most beautiful room in the Main House. Featuring a king size four poster canopy bed. Whether you are seeking the perfect getaway or are here on business this room is sure to please. A cozy sitting area set in the window alcove with two chairs with side stand overlooking the pool and gardens. Relax in front of the electric fireplace while watching TV on the flatscreen above. 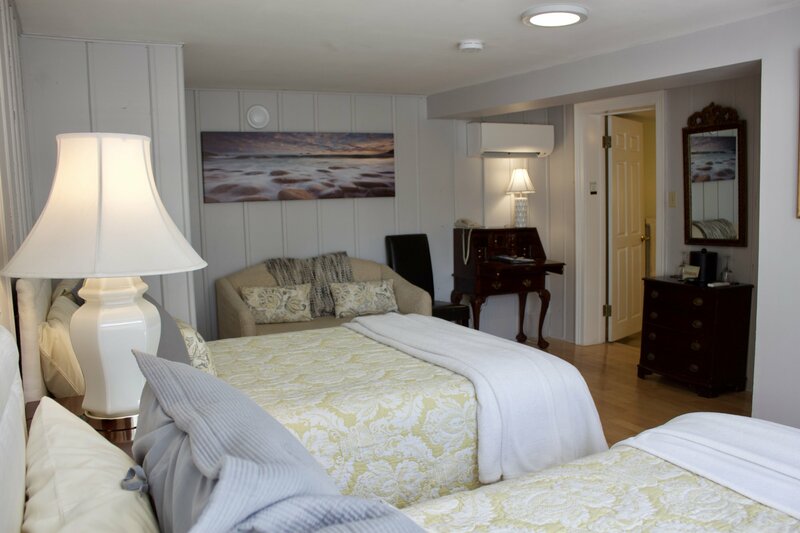 Room three is often chosen for wedding nights and anniversaries. Standard four piece bath. 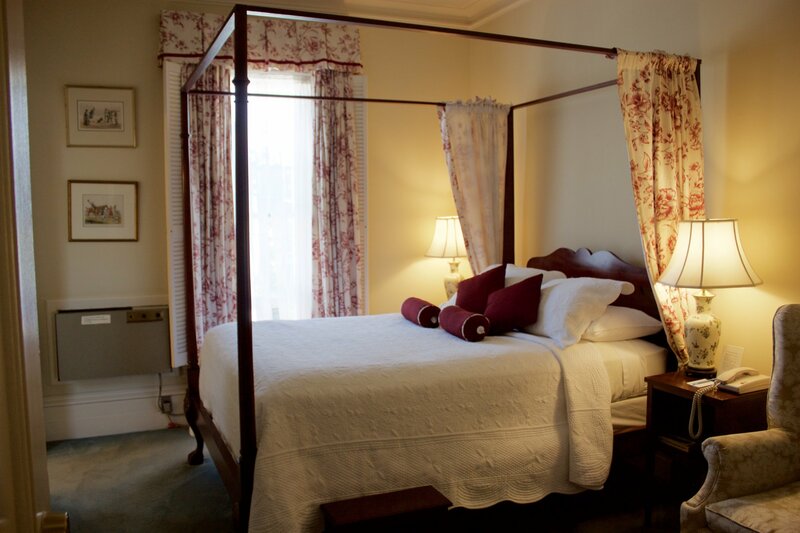 A smaller but cozy room upstairs in the Main House, room number four has a queen size bed. Decorated in a color theme of sage and ruby, this is a lovely room in which to relax and retreat. 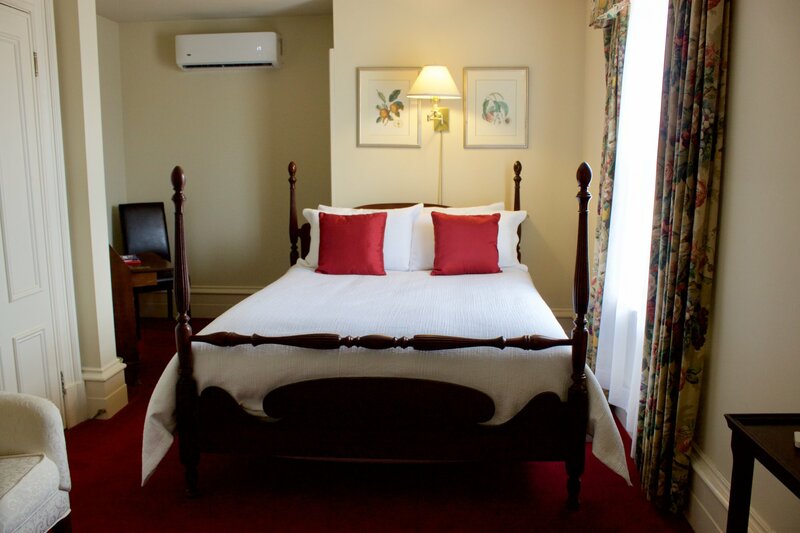 This beautiful and cozy room upstairs in the Main House has a mahogany queen sized bed with cranberry and white draperies. Two comfortable chairs form a cozy conversation corner. Floral prints grace the walls with a flatescreen TV resting on the custom made armoire. A large marble-floored 4 piece ensuite bathroom with large windows to brighten up both the bathroom and bedroom. “Toad Hall”, as it is lovingly known, has a more rustic feel than the main house. Living room downstairs with plank flooring, electric fireplace, hide-a-bed-sofa and a 7ft high exposed beam ceiling. Upstairs, you will enjoy a sleeping loft with queen sized bed and bath with corner Jacuzzi for two and stand up shower. This little honeymoon /relaxation cottage is decorated in tones of cream with carpet in natural tones. It has its own private entrance. It has a capacity of four. Sorry, no cooking facilities. A wood-paneled room painted in fresh grey tones brighten this room with a large window overlooking the property. 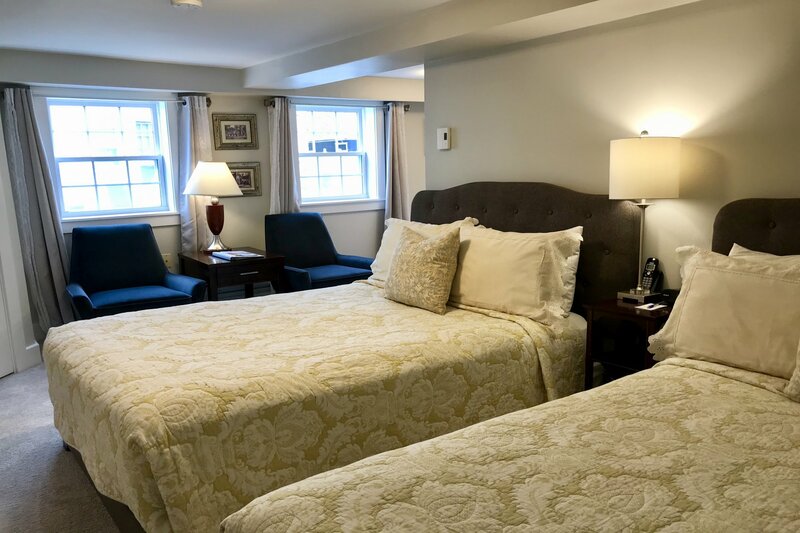 This ground level standard room located in our Carriage House features two double beds, a small writing desk and spacious bathroom with a double Jacuzzi. Decorated in soft grey, white and yellow accents. 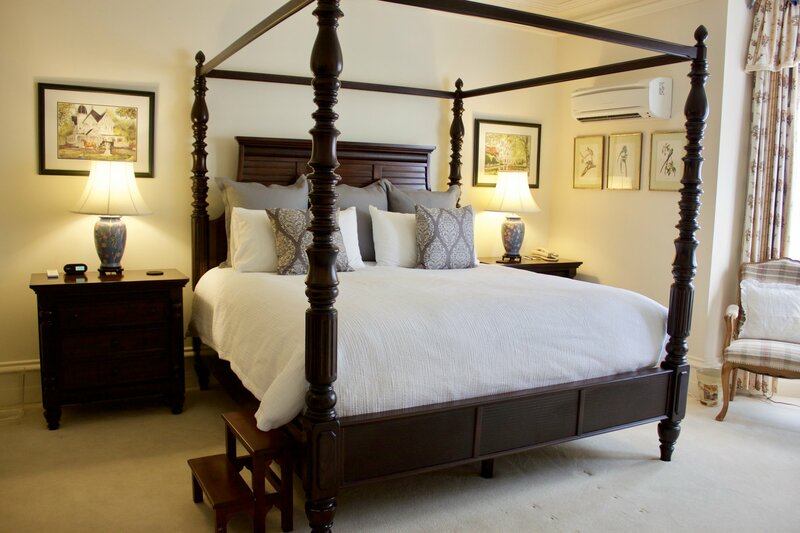 Located on the ground floor level of the Carriage House, this classic room decorated in warm grey tones with yellow accents has two double beds with dark linen headboards, comfortable chairs and antique dresser. It has a spacious, private four piece ensuite bath. 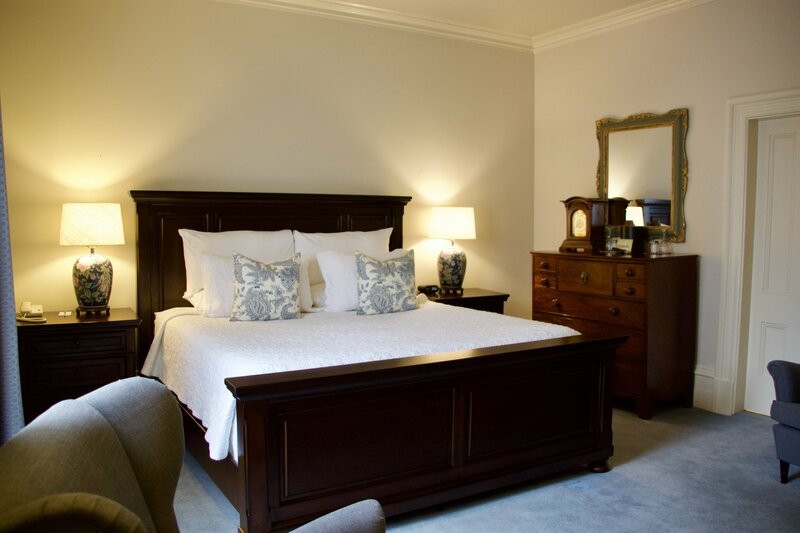 This spacious second floor suite located in the Carriage House features a dark mahogany queen size bed with storage. Decorated in light grey and blue tones giving you a tranquil atmosphere. Your full bathroom with heated tiles flooring, soaker tub, glass walk in rainfall shower and spacious seating area furnished with two comfortable chairs. A gorgeous private deck overlooking the grounds has a lovely sitting area to enjoy a nice glass of local wine or local craft beer. 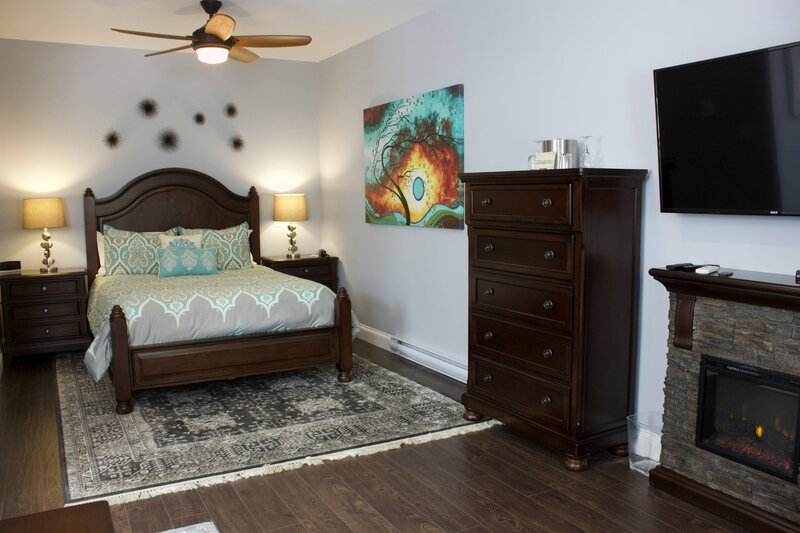 Newly constructed 400 square foot suite featuring wide plank flooring, 2 queen beds plus lounge area with sofa, decorative stone fireplace, Fibre OP Super High-Speed internet/cable, AC, 40-inch flat screen TV. Ensuite features tiled flooring with acrylic tub/shower surround, 48-inch vanity with granite counter top. This spacious suite features wide plank flooring, queen size bed, seating area with leather sofa pulling out to a queen size bed, decorative stone fireplace with 40-inch wall mounted flat screen TV above. Fibre OP Super High-Speed internet/cable, individually controlled AC. Ensuite bathroom features tiled flooring with acrylic tub/shower surround, Victorian style vanity with granite counter top.